Mmm what a great little treat on a cold winter evening. 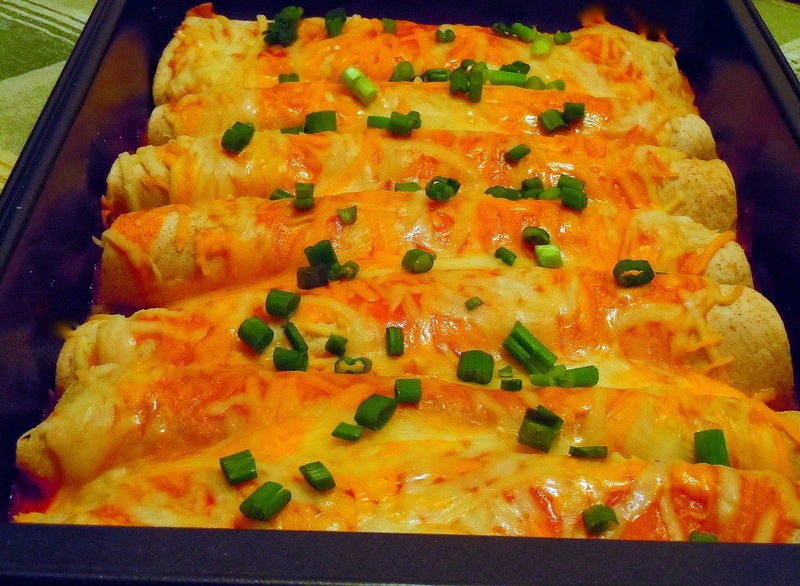 These chicken enchiladas are delicious! I had never made enchiladas before, but I love ordering them at Mexican restaurants so I thought I'd give it a try. Luckily these were really easy to make and took little effort! I used all fat free or reduced fat ingredients, but I couldn't even tell. Just knowing this made them even better since I knew they weren't fattening like the ones you can order out. If you aren't a fan of cream cheese, I promise you can't even tell it's in there. It just makes the filling extra creamy, so no need to worry. The corn is unexpected and adds a little crunch, which is a pleasant surprise. Give these a try! You won't be sorry! In a medium sized bowl, cream together cream cheese, sour cream and 1/2 of the enchilada sauce. If you don't have a hand mixer, you can hand mix until it is well blended. Stir in 1/2 cup of each type of cheese. In a second bowl, toss together the chicken, corn, cumin, chili powder, a dash of both salt and pepper, green chiles, and half of the scallions. Add the chicken mixture to the cheese mixture and combine well. Spread about half of the remaining enchilada sauce in the bottom of the greased baking dish. Spoon the filling into each tortilla, roll the tortilla up, and place in the baking dish with the seam down. 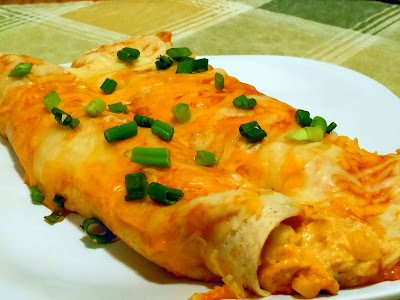 Pour the remaining enchilada sauce over the top of the filled tortillas and sprinkle with the remaining cheese. Bake for 20 minutes or until hot and bubbly. Sprinkle with the remaining scallions and serve. Thanks, Moogie! I look forward to sharing more recipes with you and I can't wait to check out your blog as well!